VOLCROWE (Volunteer and Crowdsourcing Economics) is a research collaboration between the Universities of Portsmouth, Oxford, Manchester and Leeds, funded by the EPSRC and NEMODE Network+. The goal of the project is to understand better the behaviours and motivations of participants in online crowdsourcing projects while also investigating the effective management and organisation of crowds. 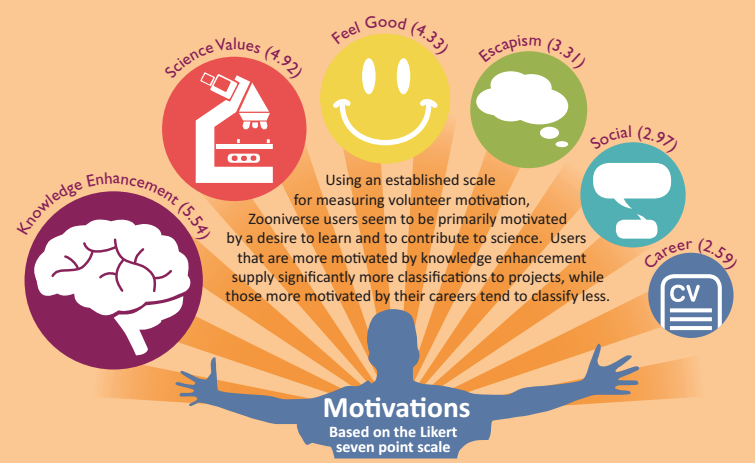 Our research particularly focuses on the collection of sites forming part of the Zooniverse; a group of crowdsourcing projects where participants volunteer their time to help professional scientists in their analysis of big data sets. These datasets typically contain complex visual information that would be difficult or impossible to analyse using a computer algorithm, but for which the human eye is a surprisingly effective means of extracting key information. Using the information provided by citizen scientists, Zooniverse projects help research teams to address significant questions relating to the nature of the universe, modelling climate change, identifying patterns of wildlife migration and even developing treatments for cancer.